With influences from constructivist and minimalist art, Begum’s works demonstrate a sophisticated spatial and visual awareness. The objects she conceives are irresistibly satisfying in their materiality, inevitably provoking closer inspection from viewers. 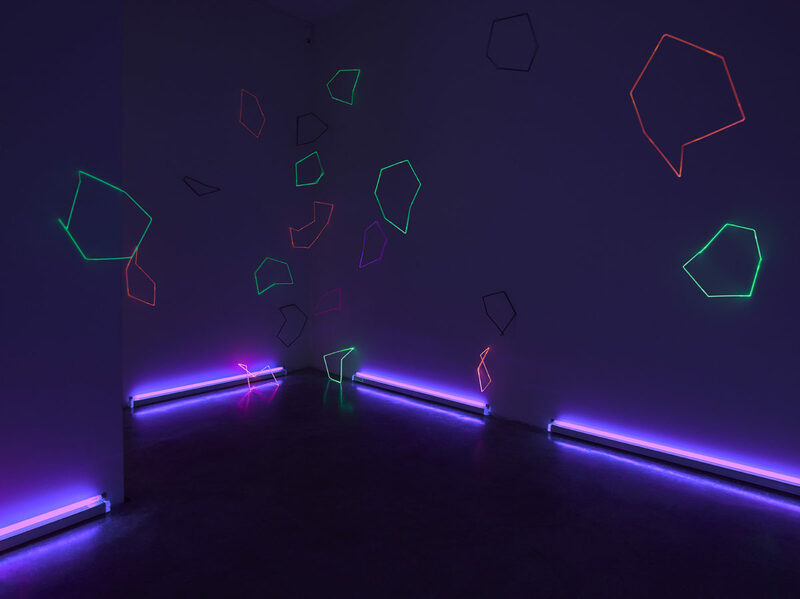 Light is an activating element in her work, its shifts and changes initiating a sensory experience. Begum is inspired by London’s built environment as well as her childhood memories, subtly referencing the geometric patterns of Islamic art and architecture. Something Curated catches up with the artist at her North London studio to discuss her solo show at Parasol Unit, upcoming projects, and the universal languages she communicates with. Something Curated: Could you tell us, broadly speaking, about your practice and the subjects you address in your work? 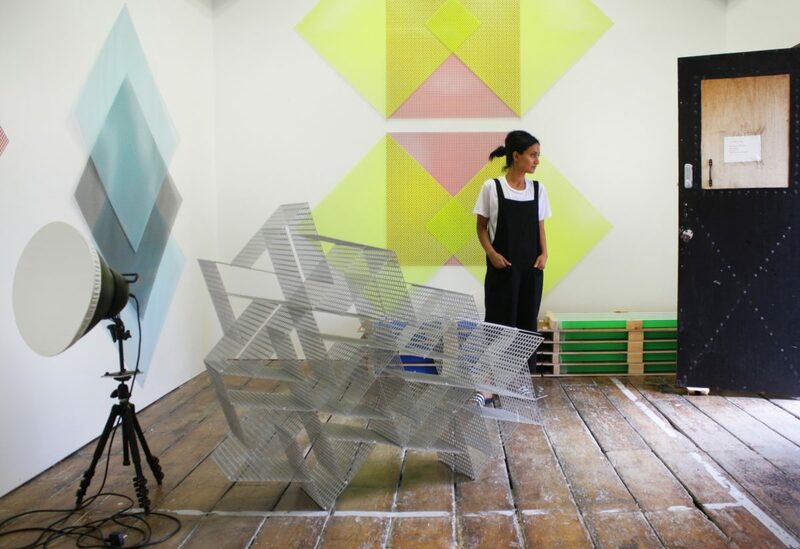 Rana Begum: My work does not address specific subjects and themes, rather I explore the universal elements of light, colour and form. Each work is like a moment on a journey with an unknown destination. 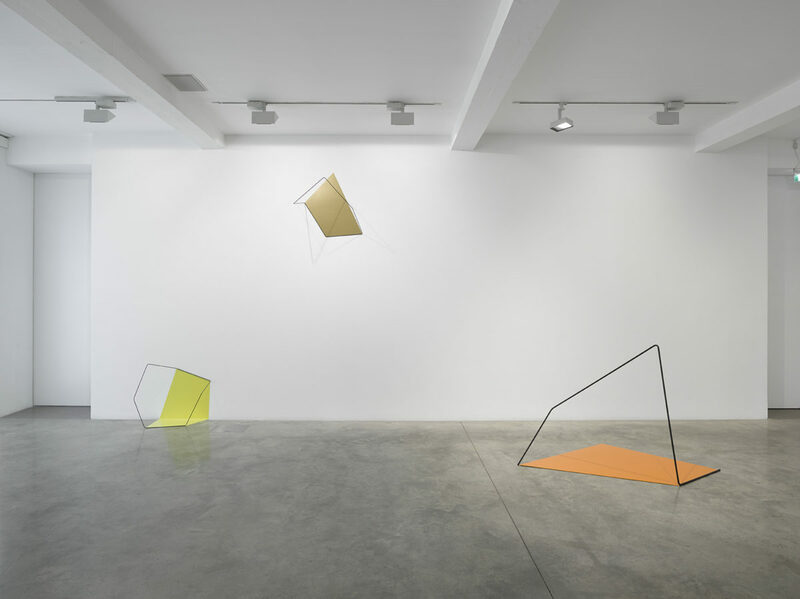 At Parasol Unit you can see common threads running through my practice: the celebration of geometric shapes, an engagement with the material at hand, and an explorative approach examining the relationship between colour and light. 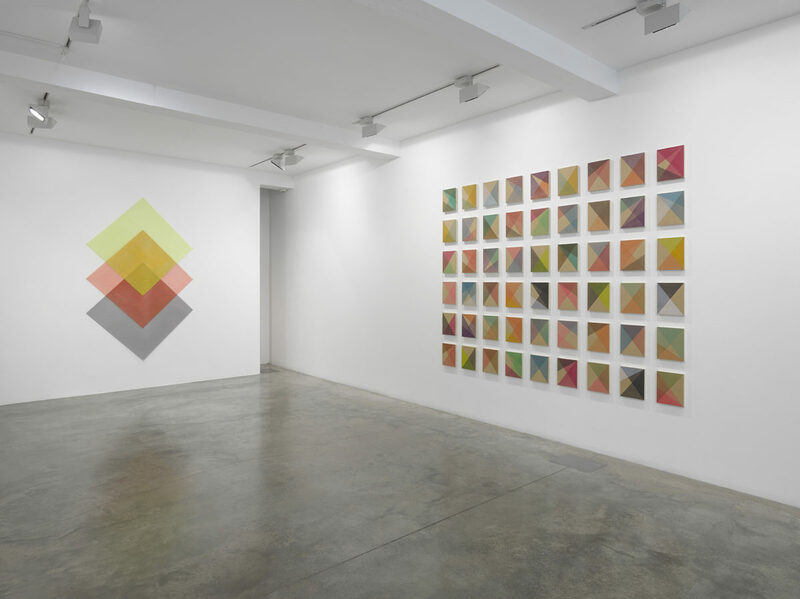 On entering the first gallery space at Parasol, the works on the right hand side represent two distinct periods of in-depth research into light and form. 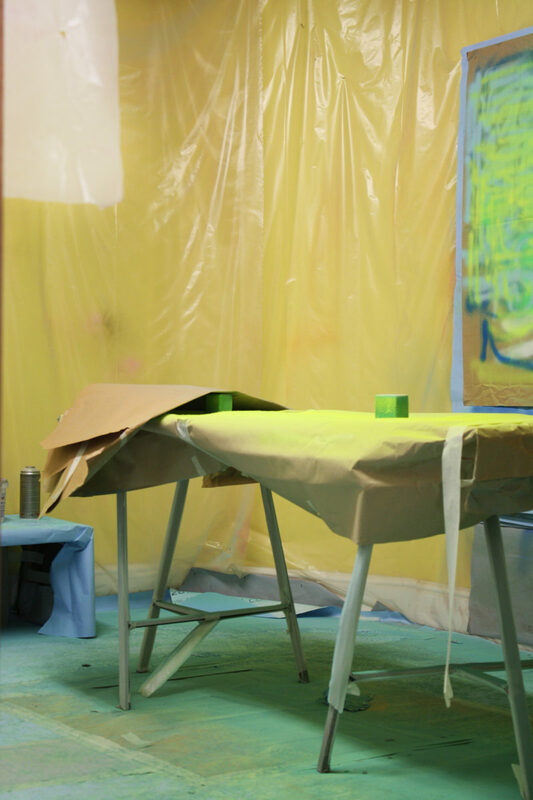 These experiments, probing how the elements interact, represent a crucial foundation of my practice – one from which the rest of the work feeds and evolves. It is interesting for me to see my work displayed like this – it spans a large breadth of time encompassing many tangents and divergences, yet, in many ways, it has all come full circle. The most recent works, the panel paintings upstairs, still remain true to these early concerns of how colour, form and light interact. SC: So do you feel the exhibition offers a comprehensive representation of your practice? RB: Yes, absolutely. This is the first time that I have presented such varied series of works side by side on an extensive scale. It allows me to see the commonalities throughout my practice but also how, by placing works from different periods together, unexpected and interesting dialogues may be created. I hope that this exhibition affords viewers a better understanding of what my practice is about as a whole. When you can see how each series of work relates to the next it is as though, as the viewer, you gain a unique insight into the artist’s thought process; the manner in which certain material or structural issues are overcome, how things are scaled up and down, and the elements which are revisited time and again. Interaction is a very important part of my work and I feel that by having pieces displayed in this manner, the viewer is encouraged to engage not just physically but on a personal level too – they are invited to become part of the journey. SC: Could you tell us about how the Parasol show came about, and the process of preparing for it? RB: I met Ziba Ardalan (Founder & Director of Parasol Unit) at Dhaka Art Summit in 2014 – a very fortuitous occurrence! I didn’t know Ziba personally but I was well acquainted with Parasol Unit and a great fan of what they do – I have always found their programme very exciting. A dialogue started, followed by a studio visit. Although at that early stage I didn’t know if anything would materialise, it is always a thrill to have a conversation with someone who understands and appreciates the work. It was such a pleasure for me to be able to talk with Ziba at length about the work and to receive her opinions and perspective. In terms of preparing for the show, it has been rather intense because a lot of the early works needed restoring and naturally the closer the show got the more the pressure increased. However, it was actually the book which took up most of my time towards the end as it was being released in tandem with the opening. This meant that a lot of works had to be professionally photographed in advance. In some ways that was actually quite nice though because it meant that during installation most of the work was ready except the main installation so this stage was, unusually, pretty straightforward. SC: What other projects are you currently involved with? RB: I’m working on a range of projects simultaneously. There are three public artworks which need to be completed by the end of the year: one in Cleveland, Ohio, at a clinic, another in Westgate, Oxford, and a final one at King’s Cross. I have been shortlisted for various projects so I shall continue to refine my proposals for those. There are also a few things coming up next year but I’d better not divulge too much at this early stage. What I can say is that I’m working on a project for Yorkshire Sculpture Park with Helen Pheby, which I’m very excited about. SC: How do you feel your Bangladeshi-British identity influences the work you make? RB: I came to the UK from Bangladesh when I was eight. I feel very fortunate to have grown up having exposure to two cultures which contrast so completely. When you are a child of course you don’t necessarily see it that way but I think now, in retrospect, it has greatly enriched my life and made me a lot more open to change and diversity. Despite my efforts to keep my work free from cultural comment and reference, I think it is naturally made manifest. I don’t have an issue with that; I quite like the fact that your past will always somehow inform the present. I frequently find myself turning to the intricate forms of Islamic art and architecture, with its bright colours and repetition. By having a strict Muslim upbringing the rhythm and repetition of praying five times a day and reading the Quran was instilled from a young age. This rhythm has worked its way into my working process. However, I think it’s important to remember that my work isn’t about religion, culture, gender or politics. Rather it is a visual universal language that everyone can relate to and understand. This is one of the reasons that the works are titled by number – I don’t wish to dictate how the viewer should interpret the work. I prefer that they find their own meaning, their own kind of connection with it. SC: What is your daily routine like? 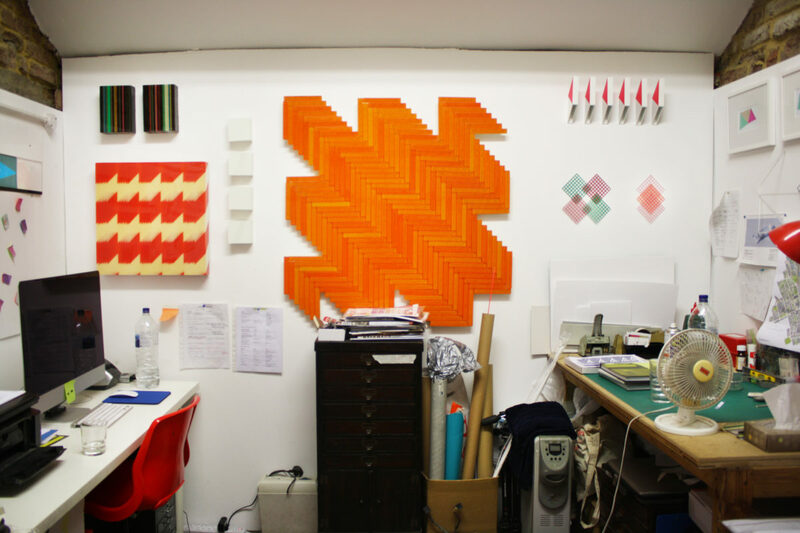 Do you work mostly in this studio or tend to move around a lot? RB: The majority of my time is spent here at the studio. Of course certain projects require site visits and often it is necessary for me to leave the studio to clear my head or seek inspiration elsewhere. Whenever I am travelling somewhere new or going on holidays I always have a sketchbook and camera with me as I never know what I might see that will inspire a new series of work. At the moment however my work dictates that I spend a lot of time in front of the computer, which is actually really frustrating because I love working with my hands, feeling the material and engaging with it; the physicality of creating something is far more satisfying than being in front of a screen. SC: You’ve produced work for several hospitals around the UK – how does working on a commission differ to your independent practice? Do you recognise a difference in the process? RB: Yes, there’s a huge difference in terms of process but this doesn’t necessarily affect how the work appears visually – it is still part of a cohesive body of work, evolving from what came before and informing what will come next. Public art commissions and the work that I produce in the studio all stem from the same thought processes. The difference when it comes to commissions is that I am considering the environment in which the work will be situated. Often you are responding to a brief that comes with certain constraints and regulations but I enjoy that challenge. It pushes the work in exciting directions. However, regardless of these constraints, it is important to me that it still deals with the concerns of my practice as a whole. With my work each project or piece generally sparks a new idea. Sometimes there are projects that I will do proposals for which might not come to fruition but these proposals then affect some of the work I make in the studio, so it’s never a loss. I suppose one of the key differences of commission work is the vast number of other people involved – structural engineers, architects, designers, clients and art consultants. That’s really where it varies most. My favourite thing about commissions is that you get to see your work on a very different scale. That’s really a lot of fun, and you get to explore new materials as well. With the hospital works for example the materials need to be able to retain the idea for a long period of time. 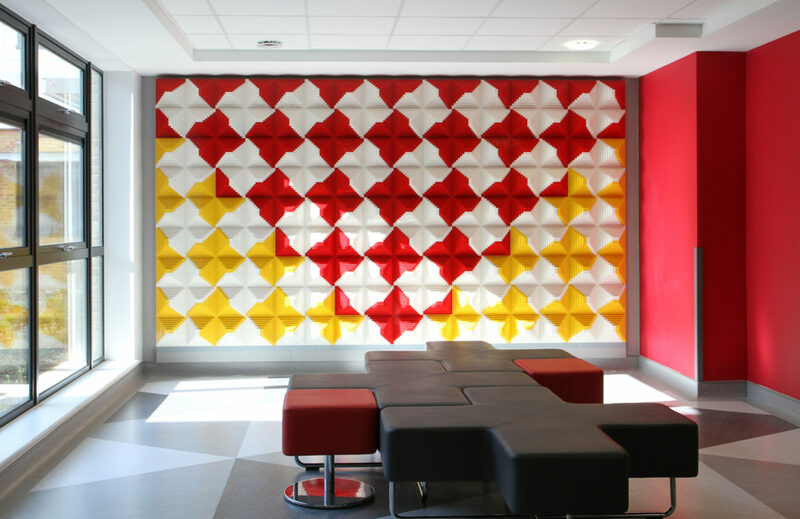 In hospital environments I always aim to create something that will provide some sort of relief – albeit perhaps rather fleeting. SC: Could you tell us about some of your favourite or most memorable projects or exhibitions? 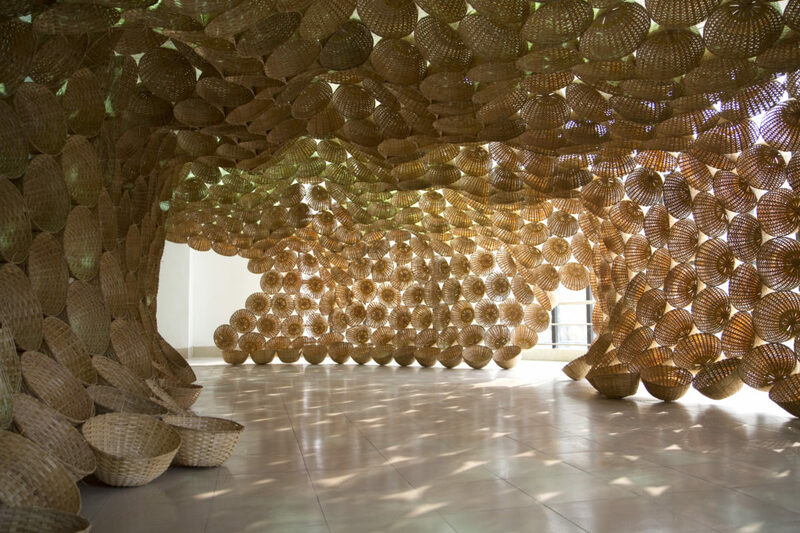 RB: I think my favourite work would have to be the Dhaka Art Summit basket installation because I felt that that really brought to life an ambition that has always been there in the back of my mind – to create a space which captures light and is calm and meditative. This work somehow managed to combine all the elements that I was interested in at that point. It’s a really satisfying and slightly overwhelming feeling when you feel that something is doing exactly what you wanted it to do, saying exactly what you wanted it to say. When I finally put that piece together, it was so exciting to be able to physically experience something. In terms of exhibitions, of course my solo show at Parasol Unit this year has been an absolute highlight. To see work spanning the breadth of my career displayed in an institution I greatly admire is truly special. SC: What do you think is unique about London’s art scene? And what do you think the city offers artists? RB: I think London offers great opportunities for really stimulating and interesting dialogue with other artists. It is not an easy city to carve a path in so generally everyone here is truly passionate about what they do. They aren’t necessarily doing it for money but rather because they believe strongly in their practice. I suppose the sheer scale of London is what makes its art scene so unique. There are so many people doing new and interesting things but London seems large enough to hold them all and generate an audience too. As a city, it provides a great deal of inspiration for my work. I am sure I am not alone in that. It’s great that you can just step out of your front door and see something new or surprising everyday without fail. It’s easily accessible too, without much effort you’re continually informed. I feel like in London you can have that isolation if you want but it wouldn’t last long before something will catch your attention and pull you back into the fray. My favourite thing about the city is its diversity. Especially in Hackney, it is so multicultural. This makes it a really exciting place to be. SC: I noticed you have gallery representation in Mumbai and Dubai – do you notice a difference in the way your work is received there as oppose to in London? RB: I was slightly nervous when I had my first solo show in India, I didn’t really know how it would be received. And the same with Dubai, as of course I am less familiar with the art scene there, but the response to the work in both places has been great. I think that is helped by the fact that the language I use in my work is universal. 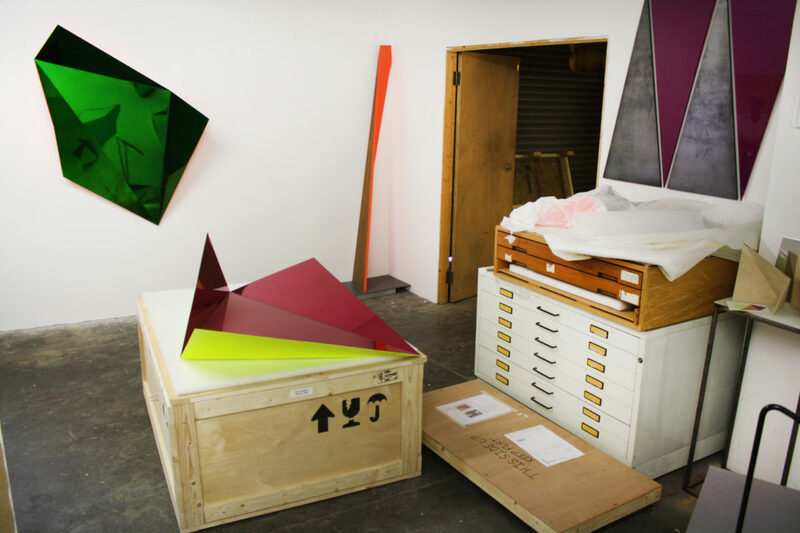 The forms are recognisable, as are the colours and materials. It makes it a lot easier for people to connect with the work when they can find something from their own experiences, culture or upbringing, which they can relate to. It’s the abstract without a narrative, which can communicate across language, gender and religion. 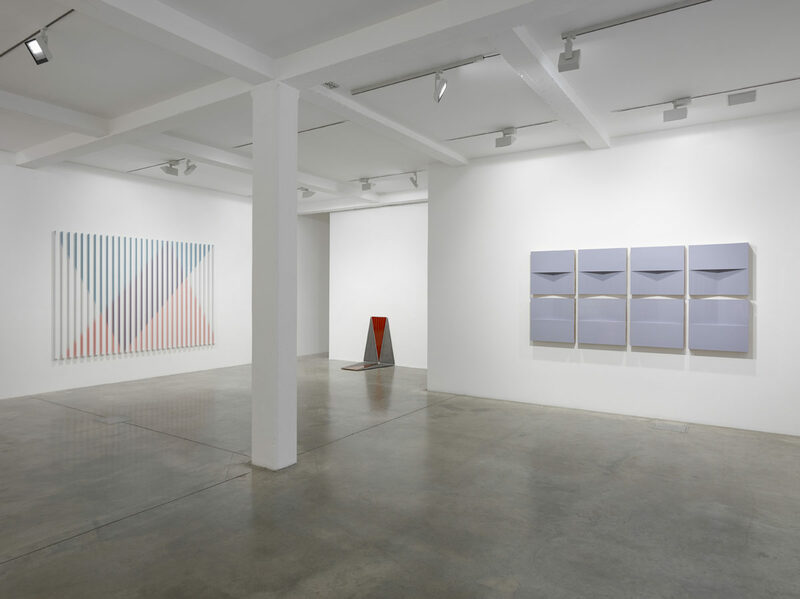 This said, I still feel like my work receives a stronger reaction from Europe – I started working with a gallery in London, called Bischoff/Weiss and then a gallery, Christian Lethert, in Cologne. This undoubtedly has a lot to do with my living in London though. I imagine that if I were situated in India or Dubai it would create a stronger dialogue surrounding the work. SC: In regards to materials, are there certain mediums you gravitate to and why do you think that is? RB: I like to use materials that are readily available and I work by responding to what is at hand, engaging and experimenting with that material to test its capacities. The work often grows out of the desire to work with a specific material rather than attempting to fit a medium to a finished design. I love working with industrial metals such as steel and extruded aluminium. When they are highly polished, they can have a jewel-like quality yet they are often put to rudimentary use. The utilitarian nature of these materials forms an interesting paradox when used for an artwork. 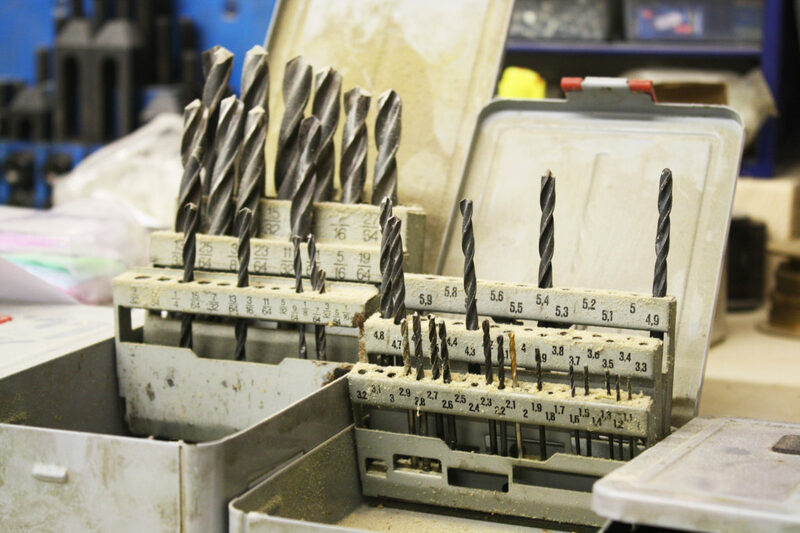 Industrial materials often feel like the ideal tools to express what I am thinking about. There is an honesty in the functionality of these materials, and I find a beauty in the repetition of their mass production, their artificiality. I find myself frequently looking to architecture for inspiration. The modular nature of built structure has had a clear influence on the way I create my work. It has been said before that my work creates illusions in colour and light but actually it really has nothing to do with illusion. The work reveals itself as you interact with it, communicating the material from which it is made, the way the colour is used – it’s not hiding anything. SC: Interestingly, you also make furniture. Could you share your thoughts on the relationship between art and design? RB: My concerns are not limited to painting and sculpture – they extend to design, architecture and beyond. Diverse and disparate interests allow me to blur the boundaries between different disciplines. 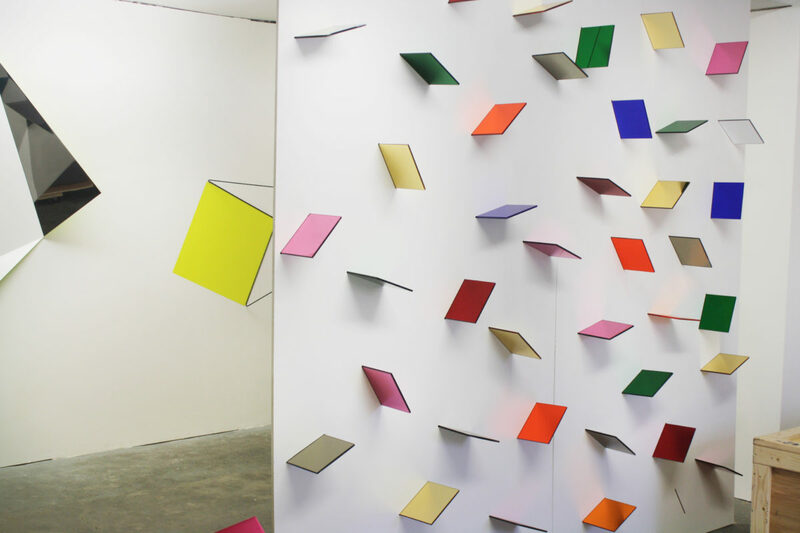 I like the idea of bridging the gap between painting and sculpture, sculpture and architecture and so on. That’s one of the things I’ve enjoyed most throughout my career – the lack of limitations. I studied painting because I felt that offered a certain open-ended quality but I could just as easily find expression in photography, sculpture or printmaking. My subject doesn’t restrict me to a specific discipline. The elements that I am most concerned with are a constant. The work is largely about the research and where that takes me, rather than an attempt to define myself as a particular type of artist. SC: What does London, particularly Haringey, offer you as the site of your studio? RB: Haringey is a really energetic part of London and it’s great to be working in an area which is so vibrant and colourful. Like all artists I struggle to find spaces that are affordable and which allow me to work without constraints, giving my practice the potential to expand. I was very fortunate to find this place but it hasn’t come without its trials and tribulations. I am only here temporarily – my old studio in Stoke Newington is currently being developed into a proper live-work space. I’m really looking forward to being back there but it was essential to move out for a while. RB: Producing art has always been something that I naturally gravitated towards. When I first moved to the UK, I couldn’t speak English. I found the easiest way to communicate effectively was through drawing and painting, so from a very young age it has been a means of personal expression. Everything I did went up on the walls. As I progressed through school, the more I realised that this was my strength, that it was what made me most content. I did my BA at Chelsea where I studied painting. I then went on to do my MA at the Slade. I took a year out in between which was in retrospect a really good idea. It made me appreciate the MA a lot more, and having that extra year’s perspective I think allowed me to get as much as possible out of this final period of study. SC: What is a piece of advice you would give to an aspiring artist? RB: I think it all depends on how much you want something. Whether you want to be an artist, a musician or a scientist, I suppose you should ask yourself what you are willing to give up or go through to achieve your aim. There were times when I could barely make ends meet but I knew that I couldn’t give up because creating things and being an artist is part of me. It’s not something I can walk away from or ignore. If you’re truly passionate about something you learn to accept that you can’t avoid it and you find a way, no matter what, to do it. RB: I live in Stoke Newington. I love it because it’s like a small village within a great city. It has a beautiful park, great places to eat and lots of independent shops. All you need really! You can’t walk out of the house without bumping into someone you know and I really like that. It is easy to feel isolated in a city as big as London but seeing familiar faces each day, having places you go to all within easy walking distance, that makes it feel like home here. You still have all the benefits of living in a big city but somehow in this quiet corner it’s like there’s a bubble around you. RB: My favourite thing to do when I’m feeling a bit stressed is to go for a run in Abney Park Cemetery. It’s really beautiful and so peaceful in there. I love running and the gym too – that’s my way of relaxing. RB: There’s a little vintage place that my friend Eka Sarishvili runs called Pictures & Light on Church Street in Stoke Newington. I’ve found some amazing gems in there and I get the first pick on petit vintage clothing. RB: I’ve just discovered this really great Gujarati restaurant in Dalston – Gujarati Rasoi. There’s this pomegranate based starter that’s absolutely delicious. RB: I’ve always quite liked the idea of living in L.A. I can imagine finding a good life-work balance there. But for holidays, the kids and I love the Maldives. The quality of light is just amazing there and there are such incredibly vivid colours. 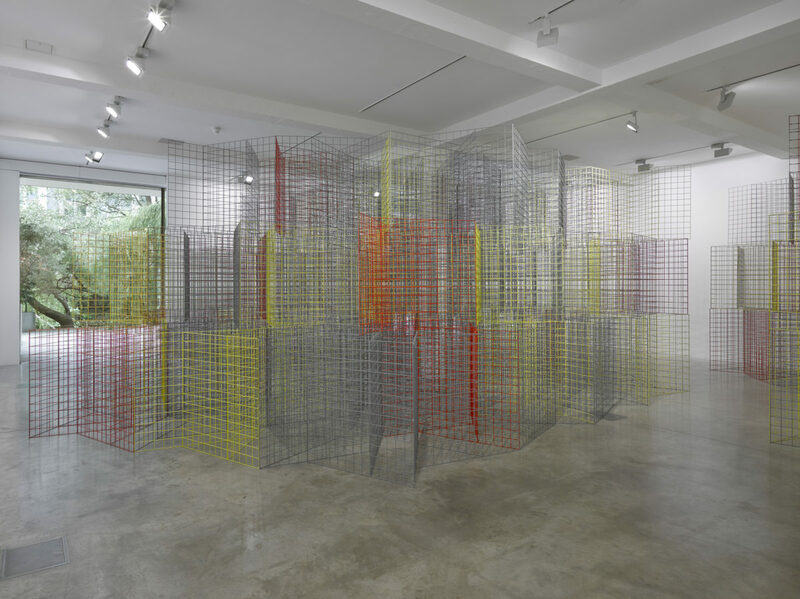 Rana Begum: The Space Between is open at Parasol Unit till 18 September 2016.